Relive the tales and spread their stories. 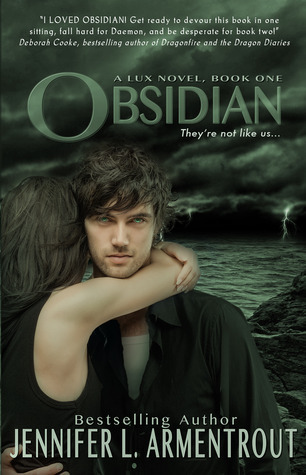 Obsidian is the first book in Lux Series by Jennifer Armentrout. And all I can say after reading the book is, WOW! This really wow me! This book is amazing! A must read! The book should be known and famous! I’m very much thrilled to know more about the Luxen. It’s like once you knew them they’ll stuck into you and you had no other choice than to indulge in their light. This is really amazing! Aliens, wow! I never knew It’ll be this addictive! And I need to agree with Katy, these Luxen really did make Superman look lame. I love Katy! I feel like we had connection specially the obsession of the books. I totally agree with her that I always able to lose myself in reading. Books were a necessary escape I always gladly jumped into headfirst. I love every scene here especially Daemon and Katy’s continuous argument and teasing. They were just so cute together! I love their chemistry. And the wait for their scorching and hot kiss? Definitely worth it! Daemon’s love for her sister was sooo admirable that it leaves me wanting an older brother like him. The climax was really good! Way too good for my liking it makes me wanting more, curious and excited! At first I thought it was the same as Twilight, but boy, I was wrong! Though there were some resemblance it really did outdid other fantasy story! I just love every bit of it. And I also admire Katy’s courage! She is such a brave girl in contrast to what she always said. I need to mention that I love Daemon’s POV and I’m dying to hear more of his thoughts! And did I say that I always love the name Daemon? Well, now I did! I always find that name dangerous and hot, your badass hero! So everybody, let’s all gather to Daemon’s alien mojo and be a part of their Lux clan! You’ll definitely love this!